Sleep is one of my favourite things, I’d call it a hobby if that didn’t make me sound super lazy, but it is also something that doesn’t always come easy, especially this past year. Moving house, living in a renovation, and generally having a mattress that didn’t really travel well in the move doesn’t really equal a good night’s sleep. For a long time I blamed the bed frame, how wrong I was, you can have any frame you want really, it is a good mattress that you need to help you sleep well, and I think I’ve found the one in Leesa, a premium memory foam bed-in-a-box mattress, you’ll be amazed at how small the box is when it arrives. 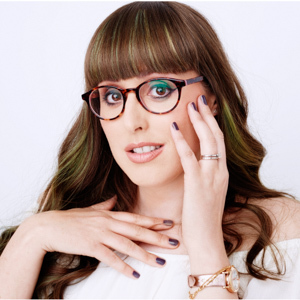 If like me you are nervous about buying something online like a mattress that you haven’t had a snooze on first, don’t worry as Leesa have an amazing 100-night risk-free trial, and I’m telling you they do that as they know once you lie down on its soft premium foam you’ll never look back. Plus, it has a 10-year warranty, and I love that for every 10 mattresses sold it donates one to charity and they have a partnership with the Arbor Day Foundation to plant one tree for every mattress they sell. I’m all for supporting companies who give back. So, what makes the Leesa mattress so special, soft and a dreamy night’s sleep? It’s all in its three premium foam layers, which have been designed for cooling, body contouring and pressure relief. When I first lied on the mattress I was worried it was a little too soft, we’ve always had firmer mattress before, but there something so comforting about sinking into the memory foam that instantly calms, while still feeling very supported, it doesn’t sag like other cheaper memory foam mattresses we’ve had in the past. I’m a really fussy sleeper, I fidget a lot to get comfortable, but after a few nights of sleep on this new mattress my husband commented on how I’m been much calmer I had been and that I was falling a sleep quicker, and I have to admit I was waking up feeling more refreshed. 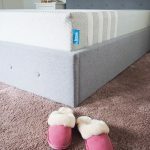 I also started trialling the Leesa mattress at the peak of the heatwave, where sleep was really hard to come by, but it gave it a great comparison with the old mattress, which didn’t have a cooling Avena top foam layer, which Leesa states provides airflow for a cooler night’s sleep and I can confirm I definitely slept better on it, and I also found that I wasn’t overheating as much as before. 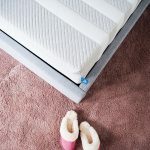 Being a fidgeter, I also need a mattress that works with me, so whether I’m lying on my back, stomach or side, or even squished into the tiniest ball, which happens more regularly than I’d like to admit, as well as working for my husband, a hard challenge, but we both love how the Leesa adapts around us, and how it doesn’t sag in the middle. The amount of mattresses we’ve slept on where I’ve ended up rolling into the middle is unbelievable. Best of all I’ve never felt such relief waking up to no shoulder or hip pain, it really has been amazing. 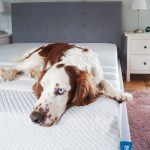 The last test for any mattress is whether it gets Falcon approval, as we generally have a Welsh Springer Spaniel who loves to sleep with us taking over the bottom of the bed, and I can confirm he is a huge fan – he even couldn’t resist photobombing my shoot of the mattress. Leesa if you are reading maybe you need to invest in dog beds so I don’t need to share mine!!! But seriously how pretty does he look with the Leesa stripes, which also go beautiful with our new bed, and I promise a full bedroom reveal blog is coming next week. When you get your new mattress, check the condition of your old one, you might not want it but if it still has a fire label attached and is in good condition you’ll be able to find a local charity, who will generally collection it free of charge as a furniture donation. 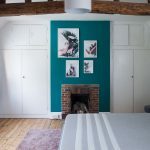 I didn’t have to with our old one, we moved it into one of the spare rooms, but I’ve done that previously and it really saves it from going to the tip before its time. If your old mattress is not able to be donated, all local councils offer a recycling service for old mattresses, ours is £30, and means you don’t have to struggle squeezing it into your car. 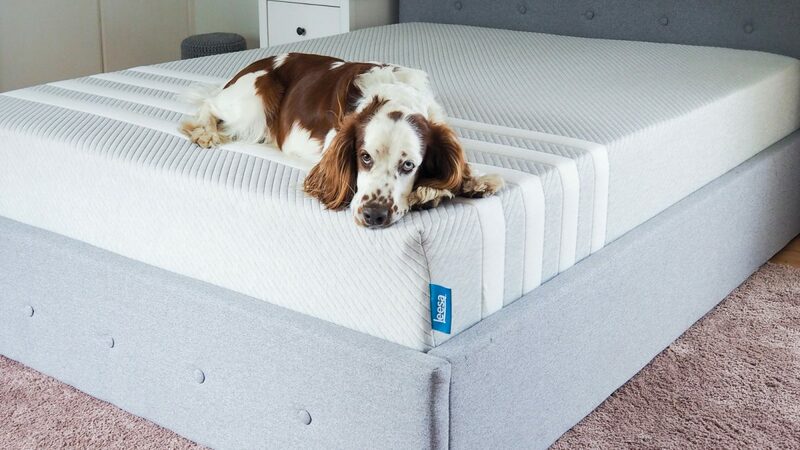 What else can I say, I’ve slept on this mattress for the past month and I’m a huge fan, I’ve really been sleeping better, I ache less and I haven’t been fidgeting as much, which my husband is very happy about, so, I can’t recommend the Leesa mattress enough. Prices start at £450 for a UK single up to £750 for a UK super king. For reference I have a UK king. They also do EU sizes, which are slightly larger than the UK. If you are looking to change your mattress, I have a nice treat for you – £100 off your very own Leesa mattress. All you need to do is use code FASHIONISTABARBIE at checkout. Happy sleeping! Have you considered changing to the Leesa mattress?